Vibrant healthy skin has a youthful glow, good coloring, and a smooth, unblemished look. However, unhealthy skin can look shallow, tired, wrinkled, and older than its actual age. No one wants unhealthy skin, but since so many people fail to understand its causes far too many people are suffering from it. Numerous things can cause unhealthy skin but the main causes are an unhealthy diet, an ineffectual cleansing routine, and poor lifestyle habits. Your skin is a living, breathing organ of the body and it needs proper nourishment and hydration to look and feel its best. When your skin is deprived of the necessary vitamins, minerals, and nutrients that it needs it is unable to functional at optimal levels and the structure slowly begins to break down. This breakdown results in dry skin, blemishes, discoloration, wrinkles, and premature ageing. In order to avoid this breakdown you need to feed your skin a varied mix of important nutrients each day. Ingesting sufficient amounts of vitamin A, a nutrient that can be found in citrus fruits and orange vegetables, can help you avoid dry skin and blemishes. Eating foods rich in the vitamin B group like brewer's yeast or breads, or taking a vitamin B group supplement, can help you ward of skin discoloration, dry skin, dermatitis, shallow skin, and premature ageing. To help discourage wrinkles, pale skin, sun damage, blemishes, and other unhealthy skin symptoms, nutrients like calcium, protein, iodine, niacin, folic acid, iron, and copper are very important to a healthy diet. Get these effective skin helpers by enjoying foods like mild, eggs, cheese, chicken, fish, leafy vegetables, fruits, and grains. Another common cause of unhealthy skin is poor hygiene. Whether this involves the failure to clean your skin often enough or the use of an ineffective cleansing routine, built-up dirt and grime can lead to blemishes, premature ageing, shallowness, dry skin, and wrinkles. When your skin is not properly cleaned on a regular basis dirt, pollution, and other harmful substances are allowed to build up on your skin and clog the pores. Clogged pores result in breakouts, dry skin, and the reduction of cell renewal. To get the most out of your cleansing routine make sure that you wash your skin twice a day, everyday. 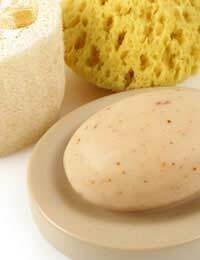 Also, make sure that you are using an effective cleanser like a soap that is specially formulated for deep cleansing. Make sure that you use gentle pressure when cleaning the skin, do not scrub or pull on the skin since this can result in tiny tears that are susceptible to irritation and infection. Finally, always follow your cleansing routine with a hydrating moisturiser that also contains a sunscreen in order to hydrate your skin and protect it from sun damage. Even if you enjoy a healthy diet and pay special attention to your skin care regime you can still be sabotageing the health of your skin by indulging in unhealthy habits. Habits like sun tanning, smoking, choosing fizzy drinks over water, and wearing heavy makeup can lead to the development of unhealthy skin. Avoid excessive sun exposure, always wear sunscreen with an SPF (sun protection factor) of at least 15, stop smoking and avoid those who smoke, drink plenty of water, and choose light cosmetics if you want your skin to stay young and healthy looking for years to come. I have severe skin pigmentation on both my cheeks, and yet I used to have very clear olive skin (I never sunbathe and avoid the sun like the plague!! ).Are there any food types I should avoid, or eat? Thank you. Diet and hygiene will be the biggest factors affecting skin, at least after the teenage years (and even then, improving your diet and taking good care of your skin will help). You need to be aware of what’s good to eat, not junk food, and wash your skin with pure soap several times daily, taking care to rinse it properly.